Expert hunters everywhere are gearing up for a new season of game hunting, and are looking for the right products to make their adventure both comfortable and successful. 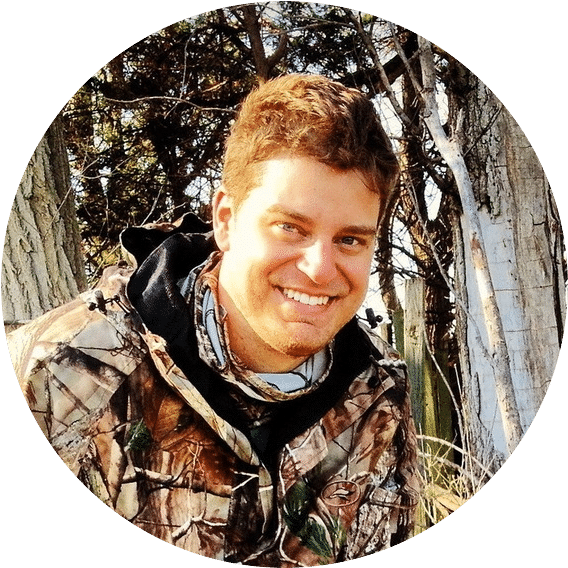 If you are looking to take up bow hunting, then the gear you have could make the difference between a great day and a very uncomfortable long afternoon. Not only is bow hunting an exciting sport for you to enjoy, but if you are looking to bring your young one who is not rifling ready, bow hunting can be a new thing for them to try. Other than keeping your hands warm during the cold season, a good pair of bow hunting gloves can also block your sent from animals and provide comfort when holding the bow. The extra protection that these gloves offer will mean that you can stay out longer and shoot with more accuracy. When picking out the right pair of gloves for you, there are a few things that you want to take into consideration. You need to pick gloves that are appropriate for the weather conditions, fit your hand correctly, and if you need extra features such as cell phone capabilities. 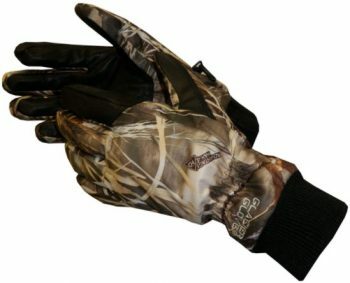 In this article, we will cover how to pick your bow hunting gloves and a few of the best options. Wearing the wrong size glove when you go bow hunting can mean that you miss your shot in the right moment. Most gloves have measuring charts so that you can make sure you aren’t buying oversized. An oversized glove means less flexibility and inability to grasp the bow in the best way. If you are using an online purchasing site to buy your glove, then the ability to measure is pretty easy! Simply flatten your extended hand and then measure it by wrapping measuring tape and the hand just below the knuckles and fingers, keeping it just above your thumb. Most charts are universal, but almost all makers use this measuring system to make sure you are purchasing the right size. Materials, what is Your Glove Made of? Depending on where you are going and the weather conditions you are planning on being in, the material that your bow glove is made of can make or break your trip. You don’t want to go with a very warm wool glove on a warm spring day. Having the right materials for your gear is important, so we have laid out a few options for you down below. Wool: A wool glove is going to keep you nice and toasty, not to mention the ability to dye wool means that you can have it in any pattern and color. These Gloves, while waterproof, can get a pretty bad smell if not properly taken care of when wet. If you are looking to have a fingerless glove, then wool will probably be your best option. Gore-Tex: One of the most popular types of glove materials, Gore-Tex is not only water resistant but it is also incredibly durable. These gloves are breathable, less costly, and comfortable. One problem to this is that Gore-Tex gloves tend to be a little uncomfortable and difficult to operate with tiny complex tasks. Fleece: Going to frosty weather? A fleece glove is going to keep you warm and comfortable. The lightweight material is both soft and breathable, and unlike wool is less likely to make you itchy. One thing that is most important to note about this type of glove is that fleece is not water resistant. If you find yourself hunting in the dredges of a wet muddy water, then fleece is not a good choice. Especially if it’s cold outside, the wet fleece gloves will freeze. Leather: Long lifespan and a cozy fit to the hands might make the perfect option for you. 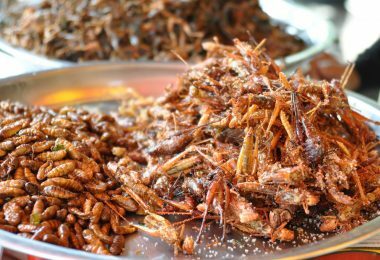 They are both flexible and trap in heat to keep you warm. However, if you are a multi-season hunter, then you may want to go for a more breathable fabric. 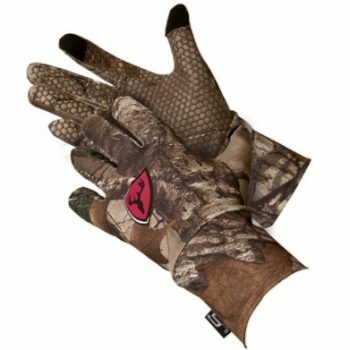 There are a few types of different designs you can choose from when looking for the perfect bow hunting gloves. 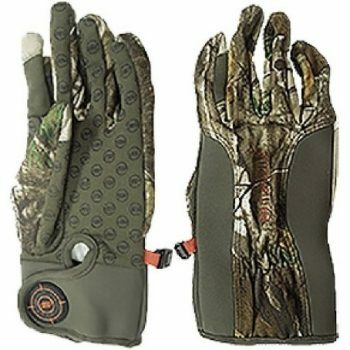 Full Gloves: Great for cold weather hunting, and protecting sensitive skin on your fingers. 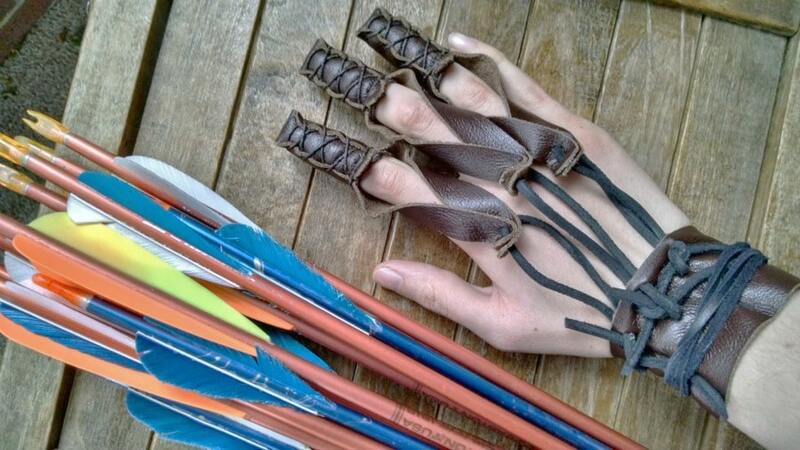 Fingerless Gloves: Create excellent dexterity and allow you to feel the mechanics on your bow, however, make sure that you don’t bring them to cold weather hunts. Mittens: Probably one of the toastier options that will keep your fingers very warm while you hike out to your favorite hunting spot. Unless you are wearing a full glove liner underneath, or have a hybrid mitten, you might find it difficult to use these. Riding Gloves: These gloves are incredibly durable and great for people who have very sensitive hands. However, because the gloves are very thick to allow for plenty of use, you may lose some of your dexterity and flexibility. Each type of glove is a little different and hunters prefer the different styles depending on weather, the trek they need to make when going to their favorite hunting spots, and how sensitive the skin is on their hands. 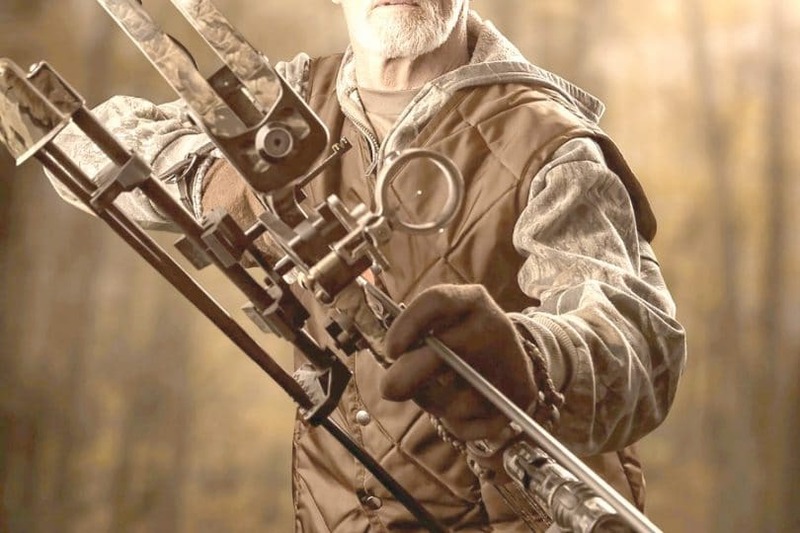 Another factor to consider is how dense the glove is, you want it to keep your hands warm with plenty of material, but not so much that you can’t firmly grip your bow. You need to balance between durability and flexibility and for the ultimate hunting trip with you and your friends. Now that you are ready for a little bow hunting with friends or your young ones, make sure that you gear up first. Having the right size and material for the glove can make or break your trips comfortable and successful. 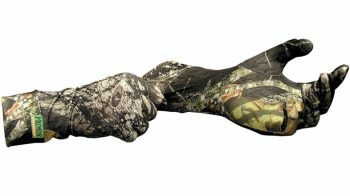 Below we have reviewed some of the best bow hunting glove options for your big trip! Specific Features: These excellent Primos Stretch-Fit Gloves are perfect for warm weather bow hunting, the stretchy material fits most people and is breathable. The glove is very thin and wicks moisture away from your hands, because of their material they can be used as a liner for a different glove if you plan on going out into cold weather. Finally, they feature a sure grip and have a 5” cuff. Description: If you are looking for a good glove for turkey season, which is the early season for bow hunting when it is still warm, then this low price stretchy glove might be perfect for you. It is stretchy so if you find that you are needing gloves for larger hands, the finger lengths and extended cuffs are going to fit. They are reviewed as having a comfortable fit and because they are thin you can operate your handheld GPS device or your phone! These gloves do have a few drawbacks to take note of, they are not water repellent so you don’t want to be bringing them out in any wet areas. 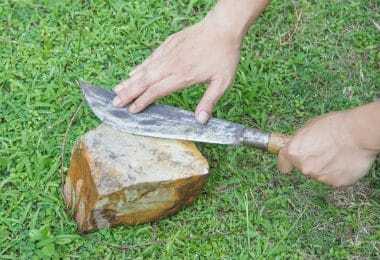 Also because of the materials, some have found them to snag while pulling them on over calluses or rough spots. Some of the gloves do not have sure grip material, but the company will replace them for you if this feature is not found. All that being said, these gloves are a phenomenal price, if you are going out for your first time, or just need a pair of gloves to use before the winter season kicks into full gear, then these are for you! Specific Features: Made with an antimicrobial power fleece shell these gloves stretch 4 ways and allow for a precision fit. The finger tips are touch-screen-compatible and have a bow release collar. Description: What sets these Manzella Productions Bow Ranger TouchTip Glove, APX, Large apart from their competition is the bow release collar which allows you to use your favorite wrist release against your skin. That being said some of the customers complain that the feature allows for too much cold air to get in. However, these gloves are not meant for cold weather and are great for anyone who prefers to use releases in an early season. The touch screen pads are highly rated and easy to work and do not take away from the overall thinness of the glove. The company offers returns on the gloves, which is good since the gloves have been sent with a few flukes, mostly the stitching coming undone within the first few trips. The company replaces the gloves quickly, if you have ordered them online, make sure that you check the stitching before going out. Specific Features: Under Armour makes these gloves with 87% polyester and 13% Elastane, making them warm and durable. They are incredibly lightweight for the materials and have enough dexterity to be good for fine detail shooting. Finally, they have rubber grip material on your index, middle, and thumb area for best use. 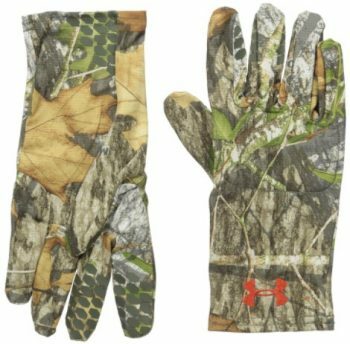 Description: These Under Armour Men’s Camo HG Gloves are really well priced, can withstand most temperatures but have been best reviewed in windy fall weather. The fact that they are thin allows for you to maneuver with your weapon the way you want. The top sides of the gloves are padded so that you can stay warm if there is wind or if it is just in general chilly. Note that you should buy these gloves a little bigger than you would plan, they have a tendency to run small. 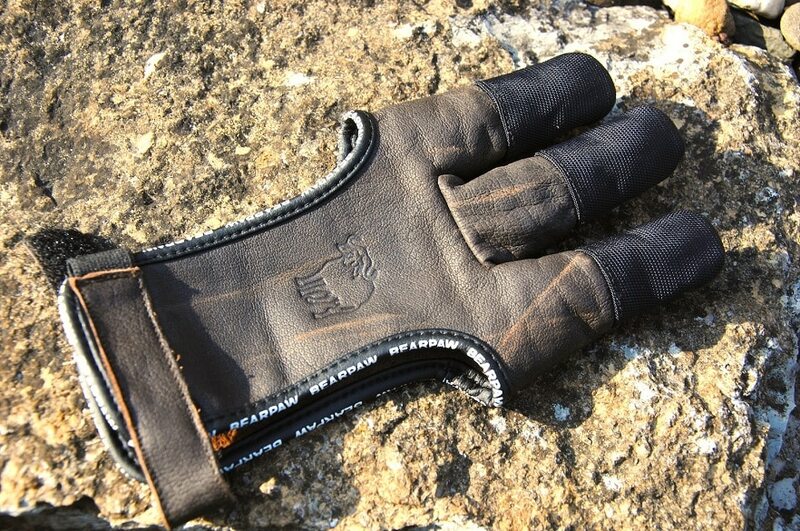 Unlike some of our gloves that we are rating, you can not easily use a touch screen phone or GPS with these gloves. If you are looking for a liner glove for your heavier duty bow hunting gloves, these are an excellent option. Most reviews mention using them originally as liners but as they move around more towards the end they act well on their own. Specific Features: These are excellent mittens for cold weather bow hunting, they feature insulate insulation and are lined with odor z antimicrobial lining for clean and scent free gloves. The warm mitten opens up to a full gloved hand to allow for dexterity in this hybrid design. Finally, the fingers are lined with pro-text material for operating your various touch screen devices. Description: These Hot Shot Men’s “Predator” Pop-Top Mitten with their 80 grams of 3M Thinsulate insulation are going to keep you very warm while the mittens are engaged on your hybrid gloves. But what will really keep you warm is the zippered heater pack pocket, meaning you can bring along little hand warmers to pop inside as you wait for the right moment on your hunt. What is possibly one of the best features, is the silent magnetic closures on the pop top of the mitten, Meaning when it is time to shoot, you won’t scare off your game ripping open loud Velcro openings. There are a few customers who noted that the gloves should not be taken under 20 degrees Fahrenheit weather. The hot pack slot allows for the wind to blow through, make it a chillier experience than wanted. Also, the finger aspect of the gloves is not a very thick material, so without the mittens engaged it can be a bit uncomfortable in the cold. Specific Features: The gloves feature 60 grams of Thinsulate for liners and are both waterproof and breathable for wet and cold climates. They have leather palms for a better grip on the bow and for optimal flexibility. 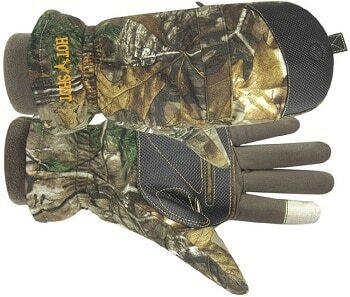 Description: People love how these Glacier Glove Alaska Pro Camo Waterproof Insulated Glove operate in cold weather. The straight forward warm liner and durable glove material keep them waterproof, flexible, and dry. They are machine washable, and not overly thick. The liner is sewn into the tips of the gloves, meaning you won’t be struggling to put them on and pull them off. One thing to note about these gloves is that they are not touch screen compatible. If you rely on a smartphone or a touchscreen GPS device, then they may not be best for you. Finally, the fleece wrist cloth will help trap in additional heat and are extremely comfortable, but if they get wet they are not waterproof and you will get soaked. Most costumers simply cover them with waterproof jackets and have no issues. Specific Features: Made of Polyester and spandex French terry fabric these gloves fit snuggly and are light weight. It has both a long 3” cuff and also a honeycomb pattern silicon grip treatment and is touchscreen compatible on both the thumb and the forefinger. The trinity scent control technology keeps your gloves from getting too gross after the first use. Description: There are quite a few differing reviews about the quality of these gloves, mostly because the seams come apart after the first few uses. 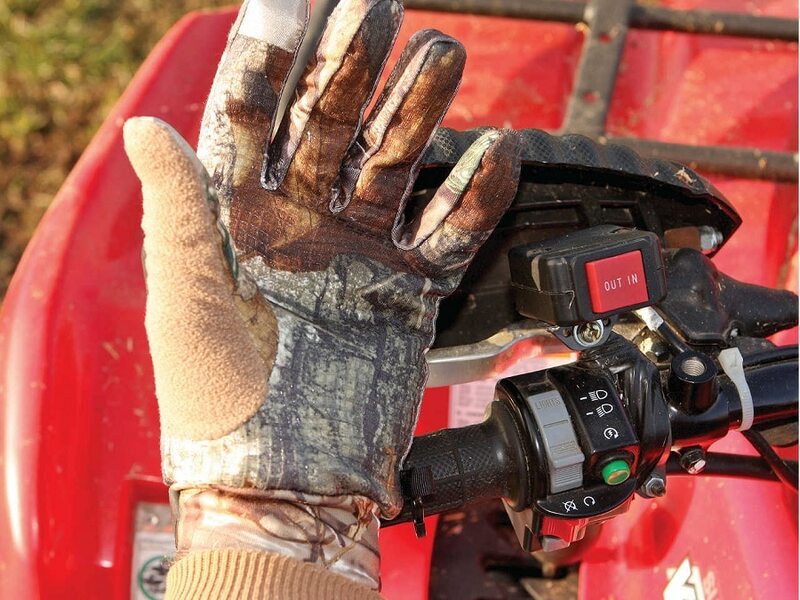 ScentBlocker Trinity Glove with Text Touch are also not meant for weather under 40 to 50 degree Fahrenheit. The gloves also run a bit small so make sure to order a size a little larger, and if you do find that the seams are ripped open between the fingers than you should request a new return. On the plus side, the gloves smart finger technology works very well, so if you are using a GPS device or even use a Kindle to read while you wait during your hunting adventure. The scent blocker works even after a few machine washes, so the human scent is blocked. Making your gloves perfect for hiding the scent from deer and from becoming a little too gross to wear around other people. When picking out your bow hunting gloves remember to pick ones that are going to best for the type of weather and terrain that you are hunting in. The season and weather will affect the material that you choose and whether or not the glove is insulated. While you may be tempted to buy a glove with the most durable material, make sure you try it on so that you can have a full range of motion and flexibility. Whether it’s your first-time bow hunting, or you are teaching a loved one or friend, having the right gear before you go out will keep everyone comfortable and able to take more successful shots. Have we missed your favorite bow glove? Or do you have more tips on how to select the best glove, let us know in the comments below!